The cat is out of the bag and the beans have long been spilled. Park City is an awesome place to be, which means that town has gotten a bit more crowded. Though traffic is thicker and our favorite restaurants are busier, that doesn’t mean solitude can’t be found. In fact, we still consider Park City a great place to find solitude. In our hustle-bustle, hyper-connected world, a few quiet moments alone in nature are a coveted necessity. There are actually a few scientific reasons that people should spend time by themselves. First, if you are surrounded by people all of the time, it is common to develop a “me versus them” mentality. Simply spending some time away from folks helps a person to develop the emotion of empathy. Increased productivity is also a byproduct of solitude. That’s because creativity flourishes when one is alone with their thoughts. Solitude gives the brain a chance to wander which in turn unleashes creativity. It is common for people to spend a lot of time and energy planning a big event like a wedding or a vacation; yet few take the time to plan their lives. A few quiet moments alone can provide perspective on one’s decisions and goals and is an opportunity to reflect and plan one’s life. Scheduling a few quiet minutes in the day can be a challenge, but it is a good place to start. Just ten minutes of quiet time can have major benefits. Make sure to power down all of your devices while enjoying some quiet time with nature. Committing to a longer solitude session can be a way to reboot the brain and the spirit. In Park City we are lucky to have the Uinta National Forest just a stone’s throw away, and what is a better place to find solitude than in a National Forest? After a scenic 30-minute drive you can be in the Nation’s only West-East Mountain range. The remote mountain range contains all 21 of Utah’s 13,000+ foot peaks which makes for a beautiful backdrop. There is no substitute for fresh air, alpine lakes and wild flowers. The sound of a rippling stream can be seriously refreshing. 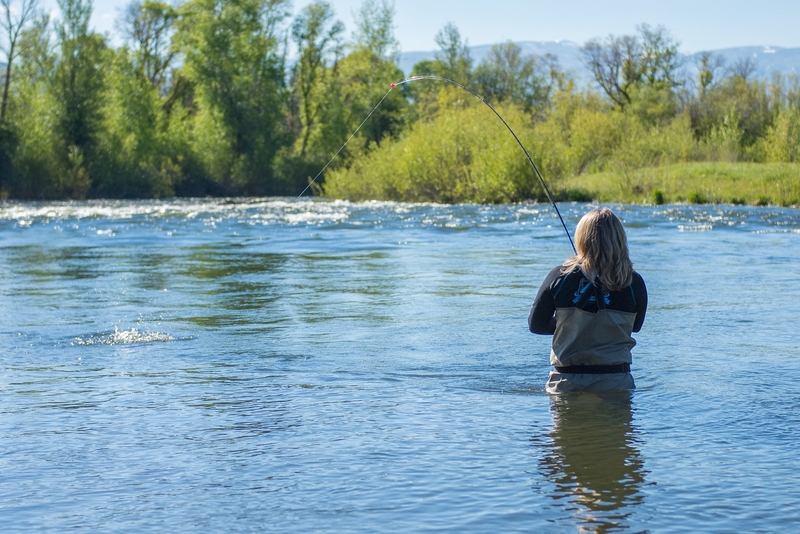 Take a half day or full day to head out for a quiet session of fly fishing. Soak up some vitamin D while you enjoy glorious scenery and serenity. A guide can help you with all logistics like a fishing license, gear, transportation, and even snacks. Catch some zen with a day on the water. There are other ways to find solitude in your everyday life. If you plan a hike on a local trail right around dinner time, the only diners you might see are deer and the occasional moose. Early mornings and evenings can also be quiet times to steal a few minutes outdoors. Step out onto your porch for 5 minutes, leave your phone inside and just breathe. If the weather isn’t cooperating or you’re short on time, try a guided meditation through an app on your phone. As important as solitude is to our happiness, it just takes a little planning and commitment for you to start reaping the solitude benefits. It might sound like an oxymoron, but All Seasons Adventures is here to help you find solitude and time in nature. The benefit of going with a guide for your outdoor adventure is you don’t have to deal with the stress of planning it. Let us grab the gear and do the planning – you come ready to breathe in nature and detox from your digital devices!